Opening and closing with mobile phone shots, Happy End (2017) could hardly be mistaken for a film by any other director than Michael Haneke. Many of his films deal with reproduced reality by news broadcasts, home videos and, recently, modern devices such as smartphones. Also recognizable is this circular structure: the final scene can be tied to the opening scene. Haneke has made use of this device in many of his films. Quite conventionally so trough a flashback structure in Amour (2012), and only briefly in The White Ribbon (2009) (the fade out matches the fade in of the opening scene). But in his earlier films Haneke made use of inventive schemes, that often involve the viewer and reveal a thing or two about the intentions of the film. 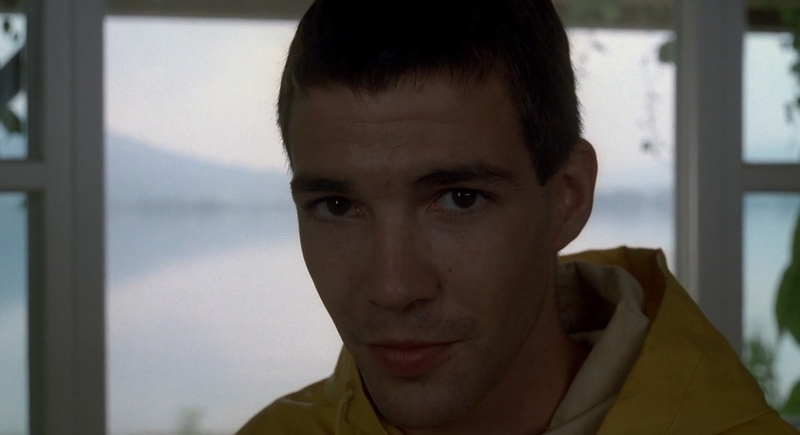 Funny Games (1997) suggests not only a cycle, but maybe even an endless cycle, with its final scene. The music that accompanies the final freeze frame references to that of the opening scene. In that scene, diegetic classical music was loudly interrupted by non-diegetic metal-like noise, foreshadowing the clash of reality and film reality. The viewer is, once again, reminded in several ways of the artificial concept of (the) film. The freeze frame, the breaking of the fourth wall, and the obviousness of the non-diegetic music come together in this one moment. Even plotwise this moment feels very artificial, as it references to the horrific way that Funny Games started. It is suggested that the whole cycle of horror is about to repeat itself in exactly the same way. It is the last stab at the viewer, whose expectations have time and again been crushed. Haneke has played a ‘funny game’ with familiar cinematic rules and conventions, denying the viewer any of the fulfilment he or she is used to. A symbolical round up can be found in several of Haneke’s films. In Code Unknown (2000) the real final scene seems to be the long shot of the man that fails to enter the apartment of his lover (hence the title). But this scene is succeeded by a little epilogue very similar to the prologue. Both prologue and epilogue serve no purpose to the plot. They literally represent themes of the film, as we see mute children impersonate something at which the other children guess the meaning. Although none of the children manage to guess the depiction in the opening scene, the suggestions (sadness, imprisonment, hiding) seem not to be entirely untrue. The viewer find himself soon guessing about the themes of this fragmented film, probably making some of the same guesses as these children. The epilogue is slightly different, as the boy in this scene is not impersonating, but using sign language. How often do we see a quintessential scene that can only be understood by people who would usually have great difficulty comprehending film scenes? In a film that is very much about borders and exclusion of people, it is only apt that most viewers are not let in on the meaning of this final shot. Haneke’s earlier films show a preoccupation with media, television, and reality as recorded by cameras. His first three films all contain a lot of shots of people watching television, news fragments on both television and radio. The news recordings are often about the effects of war, especially about the then raging war in Yugoslavia. In 71 Fragments of a Chronology of Chance (1994), at one point, news fragments are even repeated. Near the end of the film, we are shown news fragments about Christmas in Yugoslavia and accusations of child abuse against Michael Jackson. These fragments are shown again about a quarter of an hour later, the climax of the film in between these moments. As the events in the climax of the film qualify as news, this scene gradually revolves into the news broadcast we have seen before. A broadcast that has now been extended with the incidents of the film’s climax. At the beginning of 71 Fragments it is stated that the film is inspired by news facts, so it is clear from the beginning that the film mirrors reality with the reality we receive through media, like a continuing stream. The first fragment of the 71 is already a news broadcast that takes a few minutes. Throughout the film such fragments reoccur, to finally melt together with the plot of the film in the final scene. The people involved are lifted from their ordinary lives, and made objects of this endless stream of news. Benny’s Video (1992) ends with a news broadcast as well, a radio broadcast about Yugoslavia. The images show security cameras on a police station, where Benny has just betrayed his parents. An appropriate way to show this climax, as the crucial moments of the film are shown in a similar indirect way. Such is the case with the opening scene. The content of it, and the way it is watched at, already tell us a lot about its main character, despite not having seen him yet. It is an amateur video about the killing of a pig in a slaughterhouse. The video is rewinded in order to see the shooting of the pig again, this time in slow motion. This scene shows the curiosity with violence of Benny. On another level it creates an awareness of the artificial structure of the film. The violence later on in the film, is shown in a similar indirect way, through the projection of Benny’s camera. Haneke has stated that he avoids depicting violence, in order to avoid the sensational effect violence often has in Hollywood films. He is more interested in the consequences of violence, something the larger part of Benny’s Video deals with. 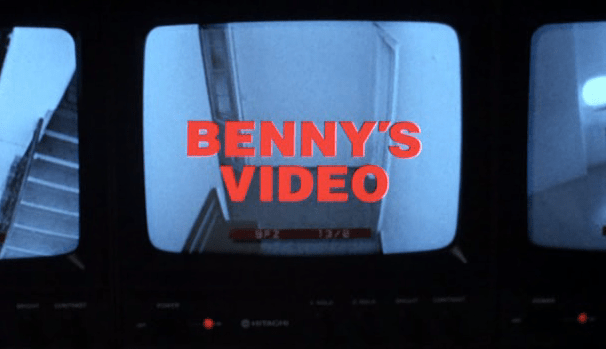 From the beginning of the film, we are let in on the way Benny receives his surroundings (often through videos) and his approach to violence. It seems like a moral choice by Benny to watch the slaughtering of a pig again, in slow motion. In a similar way, it may be a moral choice of the viewer to keep on watching while Benny executes his dark scheme. The final scene reminds us again of our role as viewer, as we are looking at cameras that show the fate of the main characters. We have ‘accepted’ the acts of Benny, just like his parents did, now paying for their egoistical attitude. Just like the other discussed films, it is hard to stay neutral as a viewer. Thematically Haneke is a very provocative director, never aiming at consensus. He provokes the viewer to take a position, to relate to the issues raised in the film. By using artificial ‘tricks’, he makes the viewer aware of the artificiality of the film. The moral issues nevertheless remain very real, and can be considered in the resulting more direct contact between director and viewer. Again and again Haneke’s final scenes are powerful reminders the viewer cannot escape this responsibility.